During a recent trip to Athy and surrounding areas in County Kildare, I paid a visit to Burtown House, a splendid Georgian house built in 1710 that has belonged to the Fennell family ever since. The Fennell family is famous locally and beyond, as one of his notable members was the botanical illustrator Wendy Walsh. Burtown House hosts many events such as weddings and yoga retreats; on the day of my visit there was a “micro festival” called Audio Garden going on later that evening with live DJs playing electronic music and even meditation. The house is surrounded by beautiful gardens including a vegetable garden. 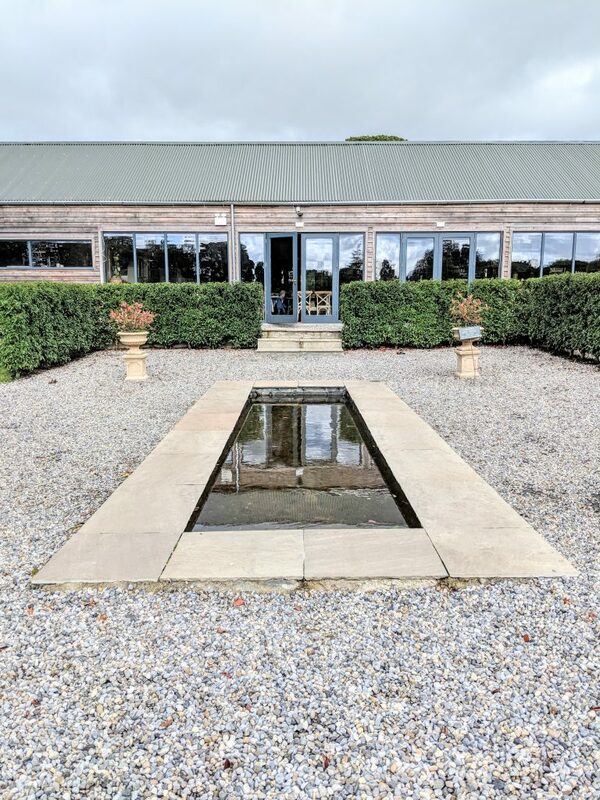 Owners James and Joanna have a great eye for interior design and built a wonderful cafe and restaurant overlooking the vegetable garden, The Green Barn (Instagram). With floor-to-ceiling windows, natural materials and Scandi minimalism, the restaurant keeps warm even on a cold day and, most importantly, you can take the most amazing Instagram pictures thanks to the fabulous light. In fact, I could not stop myself from snapping away: the view, my cappuccino and cake, and my lunch. 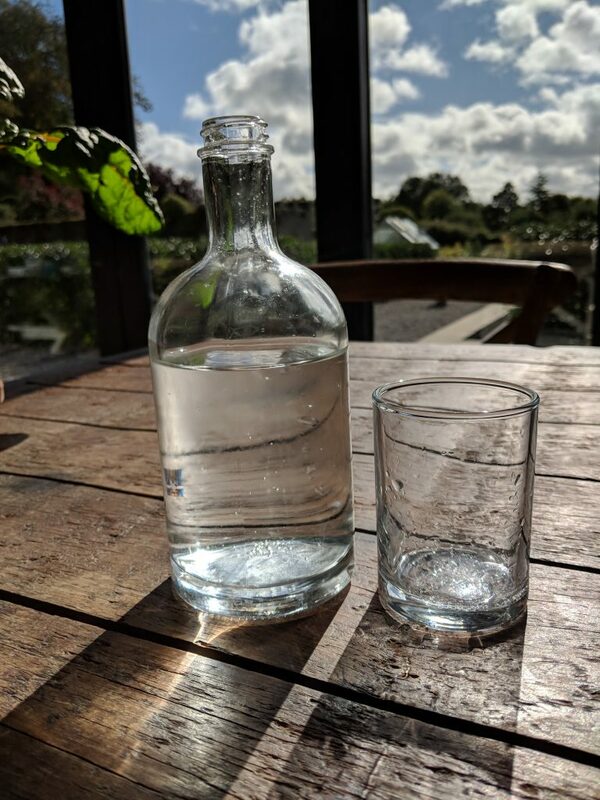 Our vision is to create an escape from the busy world that we live in where one can appreciate nature, wild and manicured with an abundance of wildlife with the very best of real organic food cooked by great chefs in a inspiring and stunning location. We plan to make what remains of our farm into a nature reserve with endless gardens and fields of inspiration, a kind of paradise for people to enjoy, relax and get inspiration. A cross of old world-built heritage, with modern touches, gardens, art, sculpture and the very best of food, always starting with the best possible produce. Let’s talk about lunch: I had a heavenly hake with garden-gathered greens including mixed leaves, wilted spinach and chard, beets, tomatoes. All these vegetables were picked earlier in the morning from the kitchen garden, lush with healthy salads, cabbages, spinach, chard, beets and also flowers like borage to support the wildlife (and, I guess, to add to a Pimms cocktail). 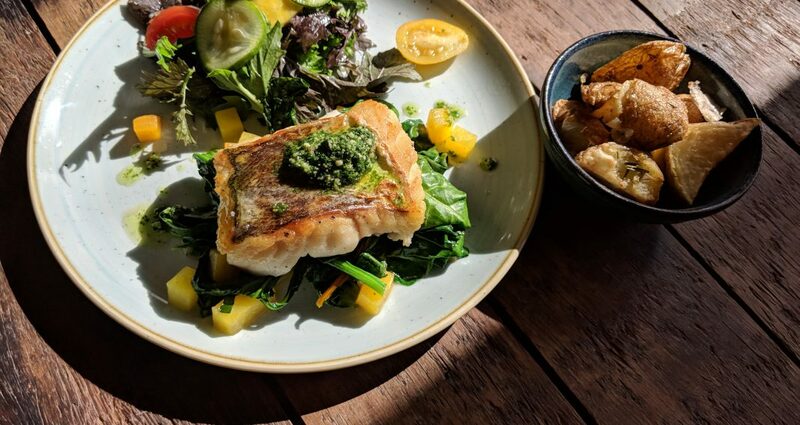 The hake was crispy and well seasoned, topped with just made pesto. Hats off to the chefs, who take great care in preparing wonderful and inventive dishes. The fish came with a side of roasted potatoes flavoured with rosemary and garlic. 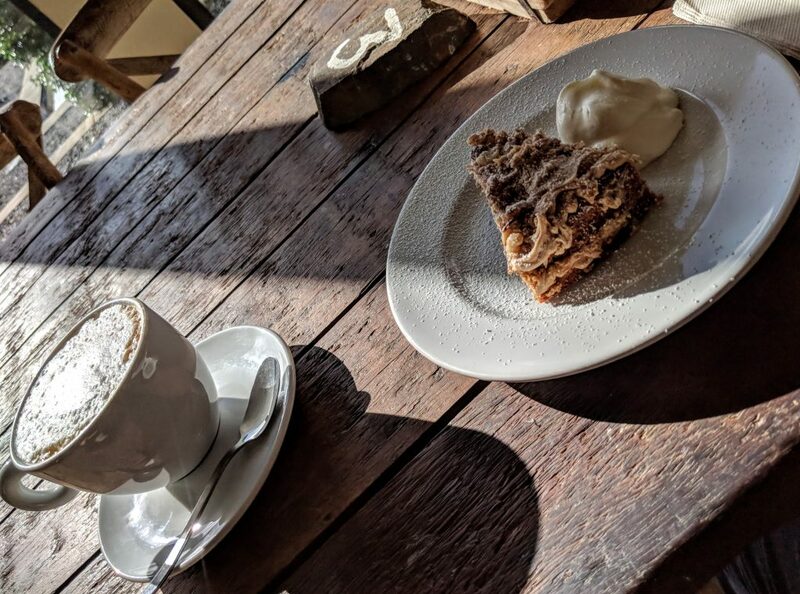 It was time to round off the meal with dessert, and I chose a cappuccino with Illy Coffee, accompanied by more caffeine with a coffee and walnut cake, which was delicious, a perfect balance of a slight bitterness from the walnuts and coffee, and the sweetness of the cake. Even the water is photogenic! 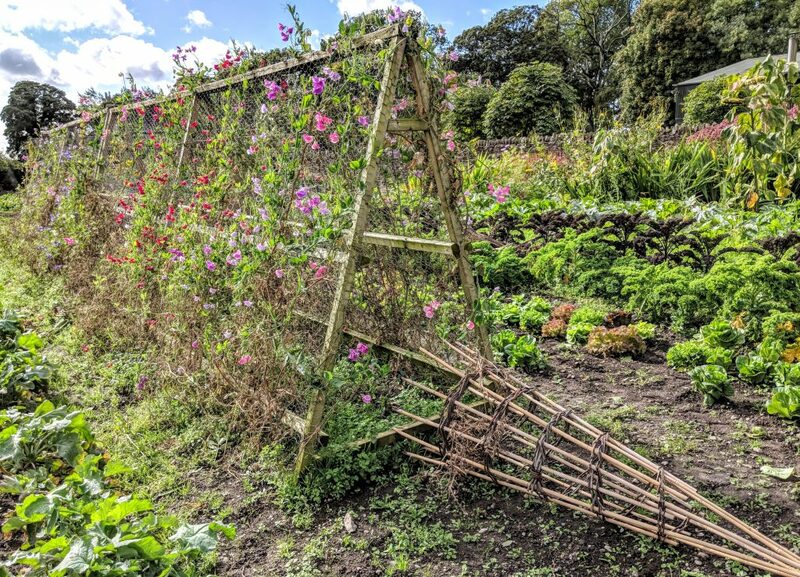 I took a walk in the kitchen garden while I waited for lunch (lunch service starts at 12.30), and I was amazed to see neat rows of vigorous plants and flowers, lovingly tended to by the farmers. The service at the restaurant was attentive without being intrusive and I appreciated the fact that I could simply enjoy my meal and the views without interruptions. Sometimes, when you are asked “Is everything OK?” while you are happily munching away, having to compliment the chef or giving instant feedback about the meal is a bit of a chore, because you have to chew and swallow your food quickly before you can speak, or you resign yourself to speaking with your mouth full like a savage. At Burtown House you can enjoy the freshest food in a gorgeous setting: it’s all field to plate (or, as the owners call it, “field to fork”), and you can even see the farmers in action before your eyes. It was a memorable meal in a stunning location. The place manages to be sophisticated and relaxed, making you feel welcome.